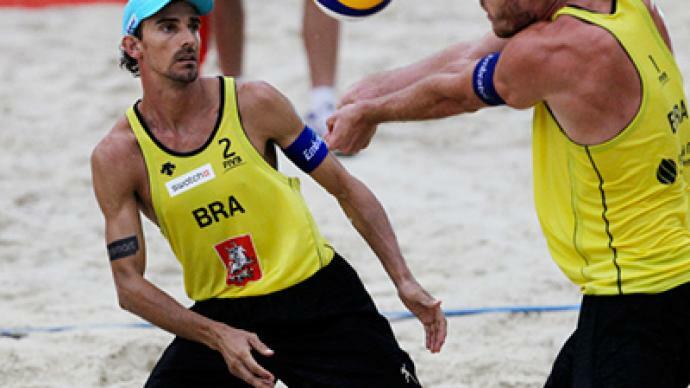 Brazil's Alison and Emanuel have won the Moscow leg of the Beach Volleyball World Tour, with the fourth edition of the tournament coming to an end in the Russian capital on Sunday. ­They had to contend with a torrential downpour, but held their nerve to seal victory in an enthralling final against Switzerland. Once again, there was not a Russian team in sight, as the men's competition reached the medal rounds. Heavy rain had been falling in Moscow since the early morning. Thankfully, it had cleared by early afternoon as the best crowd of the event braved overcast skies to watch what they hoped would be some high-class volleyball action. First up on court was the American duo of Todd Rogers and Phil Dalhausser, who took on Wu Peng and Hu Linyin in what was a re-match of last year's final. The court was still damp after the heavy rain, though this had both its pros and cons. “This makes it harder on you back, you knees and stuff. But you’re able to jump a lot higher, which is kind of nice,” Phil Dalhausser said. The match itself proved to be a cracker, with momentum swinging back and forth between the two pairs. However, it was the reigning Olympic Champions who held their nerve to take an enthralling third set tie-break and gain some revenge for their defeat in Moscow to their Chinese opponents last year. “It’s the middle of the season and we are kind of in a groove. So we usually play well. But this match here was like exact the same match here last year, except, we came out on top,” Phil Dalhausser added. The final saw Brazil's Alison and Emanual take on Patrick Heuscher and Jefferson Bellaguarda of Switzerland. However, as soon as the teams had taken to the court the heavens opened, just as they had been threatening to do for the past hour. The South American duo, who have only been playing together for a couple of years, took the first set comfortably but, as the rain become stronger, so did the Swiss, leveling the match and sending the gold medal game into a decider. The Brazilian pair looked down and out as their opponents opened up a six-point lead, however, they hit back brilliantly to seal victory though, as Emanual would go on to say, the weather conditions certainly did not help. “I think the rain makes you feel cold. I myself lose some concentration on many points. Another thing is that the ball slips more than regular. It’s hard to control. But, you know, it’s difficult for both teams,” he said. The dreadful weather did not manage to spoil what turned out to be an enthralling day of beach volleyball for the spectators, who were thoroughly entertained. 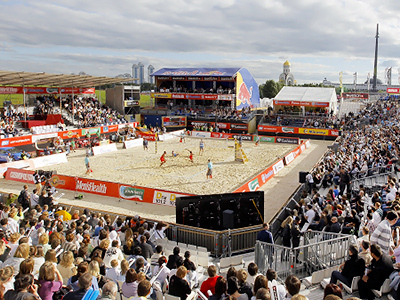 The tournament should be back in Moscow next year, as the sport looks to keep on developing in Russia.